I love comic books. I collected them for many years and I love to look at old comic covers. You can find comic book covers that conform to almost any theme. I posted several Frankenstein monster comic book covers during AWESOME-tober-fest this year. For this holiday article, I thought it would be fun to look at some comic book covers that feature the lovable image of St Nick. He’s been showing up in some form or another on comic books since the ’30s and ’40s. Santa has made many appearances in comics, this week I’ll look at some images of jolly old Saint Nick getting some help from superheroes to complete his rounds. Next week I’ll have a different Santa comic book theme. Now, let’s see Santa get some help from some of our favorite heroes. 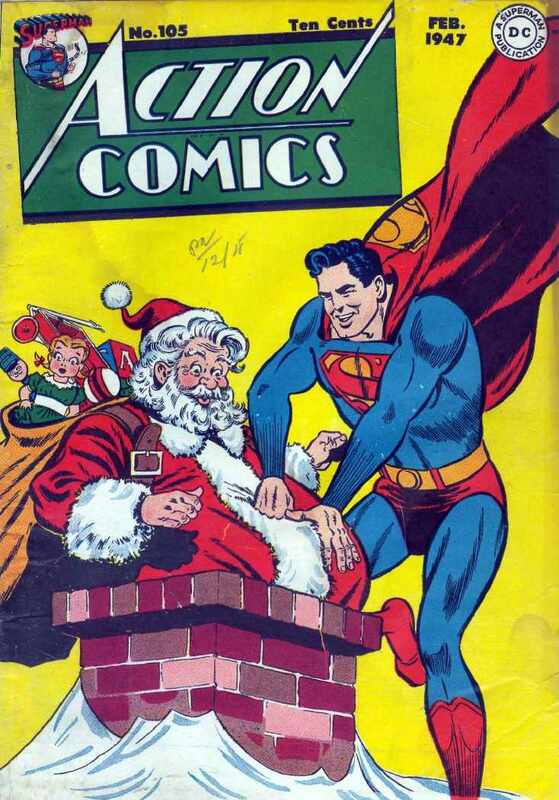 Batman #27 – Up above in the first comic cover we see Superman stop his normal duties to help Santa deliver toys. 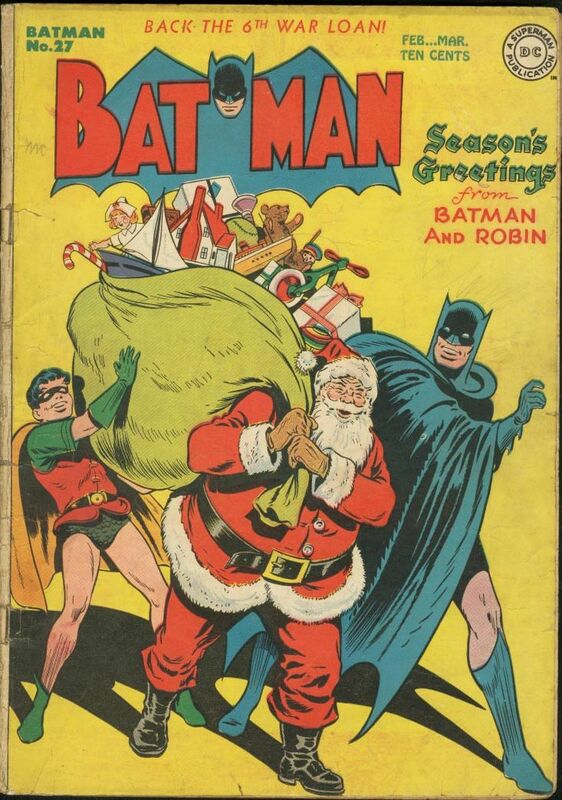 Here we see Batman laugh and what looks like smack Santa on the back while he and Robin try to carry a gi-normous bag of childrens’ toys. Batman is a douche, dude. Comic Cavalcade #5 -Ahh, here’s the golden age comic that inspired the name of this blog. This comic is famous for having covers that have nothing whatsoever to do with the stories inside. Which, now that I think about it, I wonder if this comic actually has any Christmas stories in it at all. And how BIG is that ginormous Santa? He dwarfs the heroes on the cover. 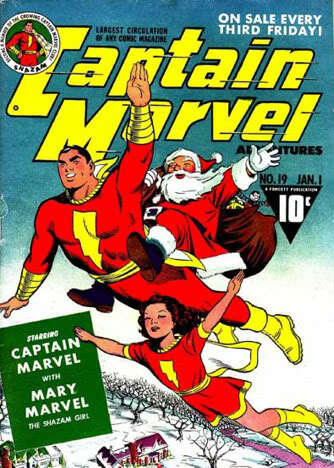 Captain Marvel #19 – Here we see Captain Marvel help out St Nick by giving him a piggy back ri–…I’m sorry, Cap, that’s just weird. Let Santa ride in his sleigh because the piggy back thing, well, it’s creepy. 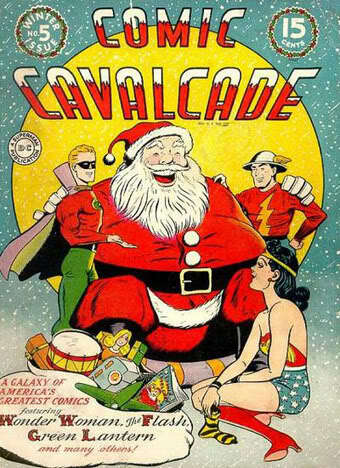 Those are typical super hero Santa covers from the ’40s, ’50s and ’60s. 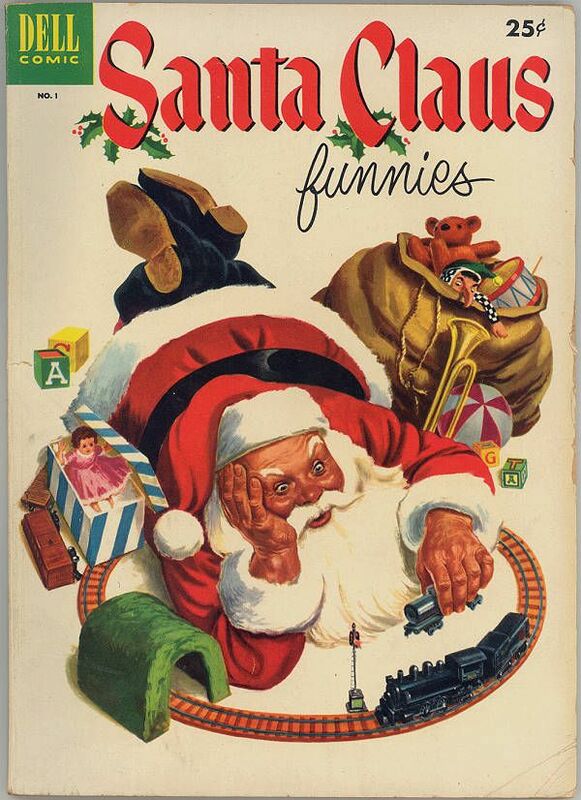 Next week, I’ll take a look at unusually violent comic book covers featuring Santa Claus. You’d be surprised at the things Santa gets into. Check back next week. This entry was posted on December 9, 2009 at 10:00 am and is filed under Christmas, comic books, holiday, pop culture, Santa Claus, Uncategorized with tags Christmas, comic books, holiday, pop culture, Santa Claus. You can follow any responses to this entry through the RSS 2.0 feed. You can skip to the end and leave a response. Pinging is currently not allowed. They totally would, Pizza. Good idea. Oh these are awesome! Do you know if Disney ever did a similar one? Disney usually didn’t have Santa himself on the cover, they usually had one of their characters dressed up as Santa. But I’ll see if I can track down any.